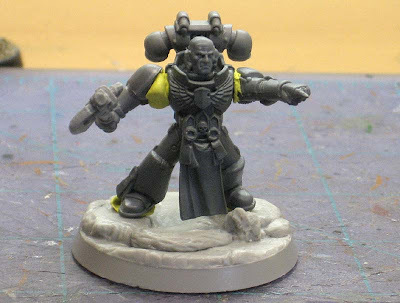 This model is in addition to the Terminator armoured Chaplain I did the other day. Both are Salamander Space Marines. Just like the Chaplain, his base comes from Dark Art Miniatures and is part of the lava base line. I've got him on a 40mm instead of 25mm base as well. With this guy, I got permission to give him a little "older" look and not so "current." The older style Librarians had lots of great character and I wanted to try and capture that with this model. The pic up top is the model "mocked-up." The arms will be open (I'll need to sculpt the flex fitting at the joints) and he's still missing lots of stuff like shoulderpads, psychic hood and such. But it gives you the general idea of how the finished model will look. The backpack is actually converted. I'll be posting a small tutorial on what I did to it. The conversion is subtle enough that most people may not even notice it, but I did it to visually reinforce the psychic hood once it's built. He's got a simple power axe like the older Librarians used to carry, back when they were the only ones that used to have them. He'll have a holster on his side to represent his other weapon since I wanted to have him pointing with his free hand. I've always though Librarians look the best when they don't have any actual weapons in their hands. It makes you wonder just how powerful they really are. Here are his shoulder pads. Both were sculpted to give him a unique look, one being the Chapter symbol and the other being for an Epistolary or a top ranked Librarian. I don't even know if they talk about those ranks any more, it may just be "Librarian" in the new Codex. As a way to reinforce the idea that he holds a rank, I thought it might be appropriate to continue his shoulder pad design on his right greave. 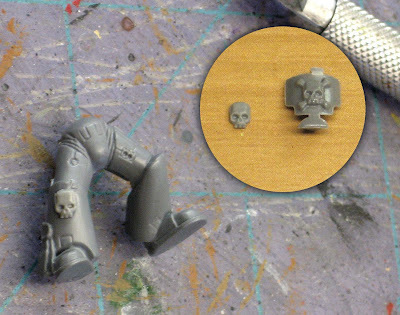 The first step was trimming a skull from the front armour plate of a Terminator. Once I had it cut out and thinned down, I glued it to his leg. 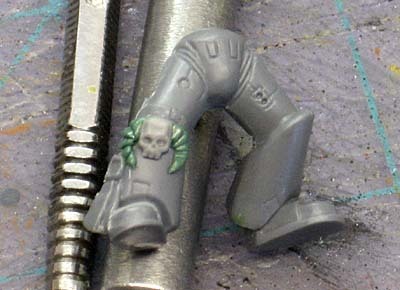 This would be the base of the leg emblem and save me a huge amount of work at such a much small scale. 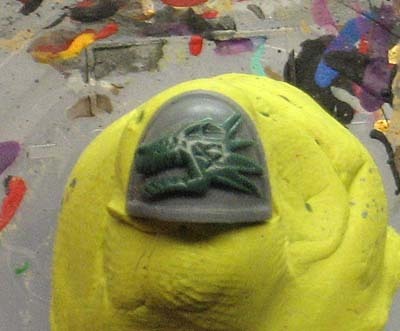 Then it was just a matter of sculpting the horns on the skull. A bit harder to do at this scale but definitely worth the effort. The hardest part was getting them symmetrical. I've got a few more posts about this guy coming up too, his backpack conversion, his psychic hood construction and how I repositioned his arms. He reminds me of Sarpedon, although that's probably just the choice of bitz for the torso and head. I like it a lot. Is this guy a build ony commission again? or do you get to put some paint on him to? He's a commission build for me, no paint on this guy. 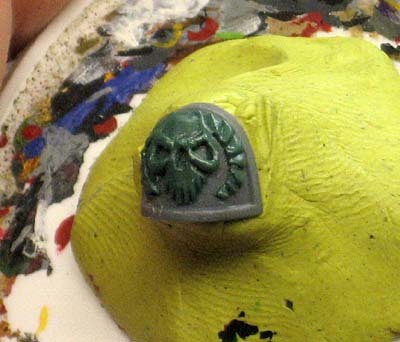 Sarpedon did use the same chest and probably the same head but that model was for another client of mine. Shame, would've love to see your paint job on this guy. And, i know about the components, i was the client for Sarpedon! I think it's the same head too, judging by the service studs. Just saying, my first thought on seeing this guy was that someone wanted you to build Sarpedon (pre-legs, of course). That greave-work is a really nice touch. Thanks guys, more to come on this guy.